Milch classification of condylar fractures. Trauma to the elbow has a high potential for complications and residual functional disability. Luckily, fractures of the humeral condyles are uncommon in adults. Medial condylar fractures are less common than fractures of the lateral condyle. Together, these injuries account for approximately 5% of all distal humerus fractures in adults. During adolescence, the distal humerus is the second most common site of physeal injury (second only to the distal radius). Supracondylar fractures account for approximately two thirds of distal humeral injuries in children. In children with elbow fractures, isolated medial condyle fractures are uncommon and account for approximately 1-2% of all distal humerus fractures. In children, medial condyle fractures occur at a peak age of 8-12 years. 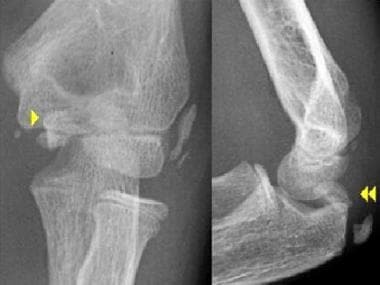 Fracture of the medial epicondyle of the elbow, as seen in the image below, is common and occurs in approximately 10% of pediatric elbow fractures. Most of these injuries occur in males aged 10-14 years. The elbow joint is composed of the bony articulation between the humerus, ulna, and radius. The distal end of the humerus can be divided into the medial and lateral condyles. 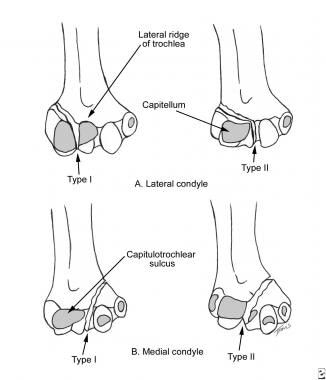 The articular portion of the medial condyle is the trochlea, and the articular portion of the lateral condyle is the capitulum. The epicondyle is considered part of the nonarticular portion of the condyle. The dividing point for the distal humerus, separating the medial and lateral condyles, is the capitulotrochlear sulcus. Distinguishing between the articular and nonarticular surface of the condyles is important in the diagnosis and management of condylar fractures. By definition, fractures that involve only the intra-articular surface have no muscular attachments and can only be repositioned by pressure of the opposing articular surface or by open reduction and internal fixation. Fractures that extend beyond the joint capsule have attached muscle and ligaments. The position of the fracture fragment is often influenced by its muscular attachment. The stability of the elbow is enhanced by its surrounding ligamentous structures. The medial collateral ligament and the lateral collateral ligament (ie, ulnar collateral ligament, radial collateral ligament) provide further stability of the elbow. The radiocapitellar joint is supported by the radial collateral and annular ligaments. Collectively, the forearm musculature originates from the bony epicondyle prominences. The wrist flexors originate from the medial epicondyle, and the wrist extensors originate from the lateral epicondyle. Because the forearm musculature traverses the elbow joint, some inherent stability to the joint is conferred by muscular contraction. The structures of the upper arm and elbow are located in either the anterior or posterior compartments. The anterior compartment contains the biceps brachii, brachialis, and coracobrachialis muscles. The anterior compartment also contains the brachial artery, median nerve, musculocutaneous nerve, and ulnar nerve. The ulnar nerve passes behind the medial condyle as it enters the forearm. Because of its location and relatively tight tethering to the epicondyle, the ulnar nerve can be injured when the medial humeral condyle is fractured. The posterior compartment contains the triceps brachii muscle and the radial nerve. By definition, the elbow is a true hinge joint that is very stable to all motions except varus and valgus stress. The articulation of the trochlea of the humerus and the olecranon of the ulna defines the plane of flexion and extension at the elbow. The elbow also allows for pronation and supination at the radiocapitellar articulation. The radiocapitellar joint does provide some stability against valgus stress by acting as a buttress to prevent medial elbow opening. Stability is further enhanced by the strength of the ulnar collateral ligament, the principal stabilizing ligament of the elbow that resists valgus stress. The radial-collateral ligament protects the joint from posterolateral rotary instability and is usually injured during elbow dislocation. The wrist extensor tendons that originate on the lateral intermuscular septum of the arm and the lateral epicondyle provide the elbow with stabilization against varus stress. Fernandez FF, Vatlach S, Wirth T, Eberhardt O. Medial humeral condyle fracture in childhood: a rare but often overlooked injury. Eur J Trauma Emerg Surg. 2018 Feb 26. [Medline]. Bhatnagar N, Sharma S, Lingaiah P, Jaikumar K, Tiwari A. Ununited Fracture Medial Condyle in a Child: A Case Report and Review of Literature. J Orthop Case Rep. 2018 Mar-Apr. 8 (2):65-68. [Medline]. Louahem DM, Bourelle S, Buscayret F, et al. Displaced medial epicondyle fractures of the humerus: surgical treatment and results. A report of 139 cases. Arch Orthop Trauma Surg. 2009 Dec 4. [Medline]. Kamath AF, Cody SR, Hosalkar HS. Open reduction of medial epicondyle fractures: operative tips for technical ease. J Child Orthop. 2009 Aug. 3(4):331-6. [Medline]. [Full Text]. Martín JR, Mazzini JP. Posterolateral elbow dislocation with entrapment of the medial epicondyle in children: a case report. Cases J. 2009 Jul 27. 2:6603. [Medline]. [Full Text]. Kakar S, Duymaz A, Steinmann S, Shin AY, Moran SL. Vascularized medial femoral condyle corticoperiosteal flaps for the treatment of recalcitrant humeral nonunions. Microsurgery. 2011 Feb. 31(2):85-92. [Medline]. Tarallo L, Mugnai R, Fiacchi F, Adani R, Zambianchi F, Catani F. Pediatric medial epicondyle fractures with intra-articular elbow incarceration. J Orthop Traumatol. 2014 Jul 26. [Medline]. Bensahel H, Csukonyi Z, Badelon O, Badaoui S. Fractures of the medial condyle of the humerus in children. J Pediatr Orthop. 1986 Jul-Aug. 6(4):430-3. [Medline]. Flynn JM, Sarwark JF, Waters PM, Bae DS, Lemke LP. The surgical management of pediatric fractures of the upper extremity. Instr Course Lect. 2003. 52:635-45. [Medline]. Geiderman JM, Magnusson AR. Humerus and elbow. Rosen P, Barkin R, eds. Emergency Medicine Concepts and Clinical Practice. 4th ed. St. Louis, Mo: Mosby-Year Book; 1998. 690-708. Green NE, Swiontkowski MF, eds. Fractures and dislocations about the elbow. Skeletal Trauma in Children. 2nd ed. Philadelphia, Pa: WB Saunders Co; 1998. 294-301. Lins RE, Simovitch RW, Waters PM. Pediatric elbow trauma. Orthop Clin North Am. 1999 Jan. 30(1):119-32. [Medline]. Nirschl RP, Kraushaar BS. Assessment and treatment guidelines for elbow injuries. Phys Sports Med. May 1996. 24(5):43-60. Papavasiliou V, Nenopoulos S, Venturis T. Fractures of the medial condyle of the humerus in childhood. J Pediatr Orthop. 7(4):421-3. [Medline]. Simon RR, Koenigsknecht SJ. Distal humerus. Emergency Orthopedics. 3rd ed. Stamford, Conn: Appleton & Lange; 1995. 147-168. Tanno M, Tanaka H, Mukai E, Hayashi Y, Takenouchi K. [Supracondylar and condylar fracture of the humerus]. Clin Calcium. 2008 Sep. 18(9):1332-8. [Medline]. Tsai AK, Ruiz E. The elbow joint. Ruiz EE, Cicero JJ, eds. Emergency Management of Skeletal Injuries. St. Louis, Mo: Mosby-Year Book; 1995. 221-250. Wilkins KE. Fractures and dislocations of the elbow region. Rockwood CA, Wilkins KE, King RE, eds. Fractures in Children. 3rd ed. Philadelphia, Pa: JB Lippincott; 1991. 509-828.